The Customize Windows > Computer and Internet > Digital Photography > What Camera Mode to Choose Depending on the Situation? What Camera Mode to Choose Depending on the Situation? How does each program mode works and how to use it? Do not fumble what Camera mode to choose. Previously we wrote about the Mode Dial or Setting Knob of Digital Camera and some more articles about various settings, specifically. In this guide, we will write about very basic thing – What Camera Mode to Choose Depending on the Situation. 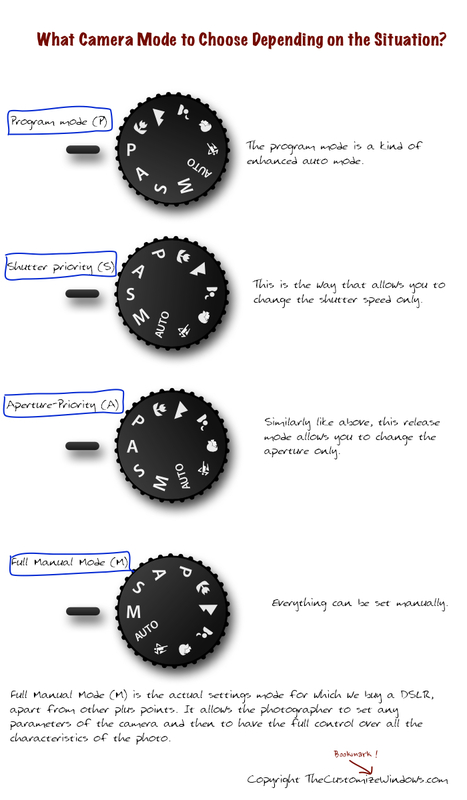 This is quite basic guide for a DSLR user which will help most of the new user. Thinking a DSLR will increase the quality of photograph, this is mainly attributable for the huge promotive misleading Ads the manufacturers. Secondly, there is a group who thinks that, buying a ‘jazzy’ DSLR will increase the social level a bit up. This is a contribution of the news type affiliate websites. The writers are either paid and hired and possibly never owned a DSLR. What ever the reason, may be you are among the rest 40%, you at least have to learn or try to learn else you have to sell it at Ebay – its quite common ending for electric guitar and DSLR camera. The combination of exposure time and aperture, determines the incoming light on your sensor or film. The sensitivity, expressed in ISO, determines the scale of a light-sensitive surface. The higher the iso (200 to 800 for example), the surface will be more sensitive. There are separate articles on the terminologies on this website, you can search within this website and read them if you need. The aperture priority mode allows you to manage the aperture, the camera will manage itself automatically according to the speed. Like all priority modes, you must select the sensitivity before. The opening or closing of the diaphragm can manage depth of field, so you can play with your depth of field. When to use a large or a small depth of field? Portrait, landscape? When to use a large aperture ? More you open the aperture, the greater your depth of field is small, it means that your depth of field is very short or shallow. On a standard lens (50mm) at f/1.8 on a subject about 1m, the net area will be between 1.10m and 1.20m for example. This mode is used a lot in portrait or macro, to get to the blurred background. It is great if you want to isolate an object or an element from its environment. In which case you will almost close the diaphragm? The more you open, the greater the depth of field is small as said above. Conversely, in landscape for example, all in the frame must look sharp. Be careful, even in low light or on cloudy days, a tripod may be necessary. A small aperture (f/22 for example), the exposure time can drop low enough to compensate the exposure. The shutter priority mode lets you choose the shutter speed or exposure time, the other then manages itself the aperture. You choose the sensitivity, as in aperture priority mode. The longer it stays open, light enters your (camera’s) sensitive surface. The setting becomes difficult when you have a movement to shoot, according to its speed, but also sought depending on the light conditions. The shutter priority mode allows to capture movement without risking blurred subject that is moving too fast. In sports photography, it is often used because it can isolate the movement. Thus, the photo against a speed of 1/800s is chosen so that the subject is in focus despite its speed. However, a lower speed will be chosen to create a motion effect and simulate the impression of speed. In such cases we use a monopod. Slow speed is often used in landscape photography to create “fuzzy” effect on the flowing water – Seas, rivers, streams Using a tripod is essential, because it is in excess of the second and the slightest movement of the case would create a bad “blur”. This is basic, there are other ways for the effect. Program mode allows you to keep your control on some settings, such as sensitivity, like over / under exposure or white balance. However, the device determines the correct shutter speed / aperture lens, so that you can not not have all the freedom you want. This mode is a good way to begin to understand the initial setup, the sensitivity is a pretty important factor in the quality of your images, including the amount of digital noise present on your photo. Other two modes are Automatic and Manual. Manual should be used or rather must be used after a good practice and unless there is hurry, manual mode obviously the best. Rest is auto mode. It is practically kind of mode where the DSLR becomes like a point and shoot camera – the result obviously is not great because everything is determined by the camera. There are some brand specific modes like Sport mode, portrait, etc., they are merely extensions Auto mode and do not give access to any settings. This Article Has Been Shared 7842 Times! Articles Related to What Camera Mode to Choose Depending on the Situation? Title: What Camera Mode to Choose Depending on the Situation? Cite this article as: Abhishek Ghosh, "What Camera Mode to Choose Depending on the Situation?," in The Customize Windows, June 12, 2013, April 18, 2019, https://thecustomizewindows.com/2013/06/what-camera-mode-to-choose-depending-on-the-situation/.